This travel cup from Fresh Taste is my favorite and I have been using it everyday. It keeps items extremely cold or hot for a really long time. My husband is actually the one that uses it the most. I put his coffee in his cup and it stays hot for him all morning. Then I refill it for him at lunch and he has hot coffee all afternoon. It’s spill proof so as long as he has it closed then it won’t spill even if he knocks it over. You can just push the button on the top to open or close. It’s a really nice looking cup and is made of stainless steel. It really does keep stuff really hot for a long time though so make sure that when you put the drink in the cup it’s at the temperature you want it at. I didn’t realize this the first time I used it and put in really hot coffee and my husband had to pour it out into a regular cup to get it to cool down so he could drink it. It’s a great cup though and since it’s spill proof great for traveling! Vacuum Insulated Travel Mug: Double wall construction allows temperature retention of hot liquids for 5 hours and cold liquids for 9 hours. Great for a long day at the office or for carrying around while you are out and about. Push-Button Operation: Leak proof lid with one hand push button operation, great for those who are right or left handed. Designed for on-the-go drinking and fits in most cup holders for a quick no mess get away! Unbreakable Stainless Steel – Electrolytic charged inner steel constructed with food grade stainless steel for a toxic free environment and unbreakable stainless steel exterior. Tea Bag Hook – Not just for use as a coffee mug! The built in tea bag hook makes this a great tea mug too! So tea drinkers can brew on the go and the hook will even hold most loose leaf infusers. BPA Free – 100% Non toxic travel mug finished in a way that doesn’t leave any inner coating lacquers. 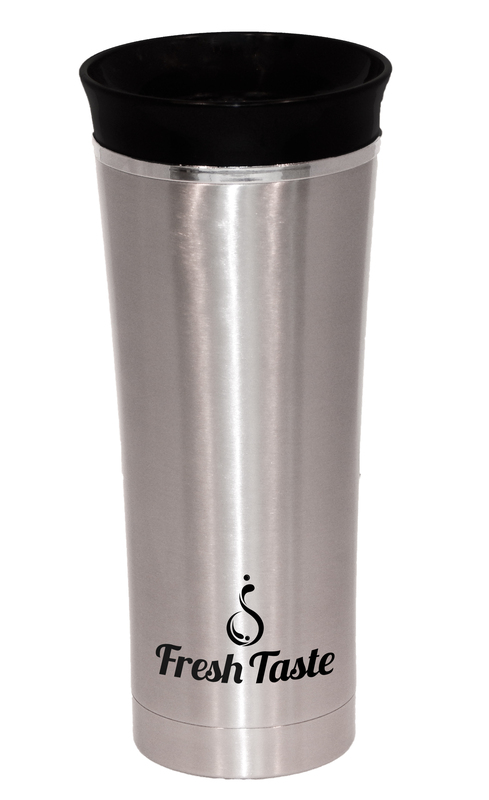 This leaves the travel mug free of BPA, phthalates, lead or having a metal taste. The push button lid is also BPA free.